RMS Power Rating 2 ohms: 1000 watts x 1 chan. RMS Power Rating 4 ohms: 700 watts x 1 chan. 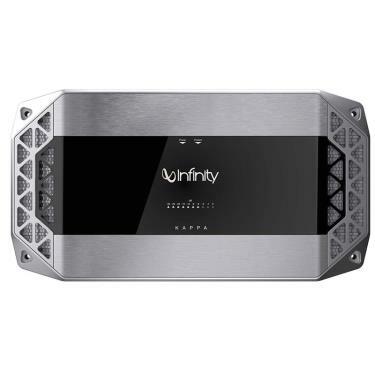 Infinity K1000 Kappa Series Amplifier is a Mono subwoofer amplifier with 1,000 watts RMS x 1 at 2 ohms. The Kappa Mono Class D amplifier is highly built solid and reliable. It generates a lot of power without taking a toll on your entire system. The amplifier is presented in a brushed steel industrial design. The amplifier features Noise-rejection Differential inputs. Hassle-free firmware upgrades are possible with a microUSB port connection. Upgradeable firmware will assure that the amplifier will always be up to date. The total Peak Power Output is 2600 Watts while total RMS Power Output is 700 Watts. It also has a Bass Boost of 0-12dB as well as a Bass Boost Frequency of 45 Hz. The Speaker Level Inputs accept RCA connections. Adjustments can be made using the controls located on the side of the K1000. Crossover, Input Level and Gain can all be adjusted. Match the amp’s input sensitivity with the adjustable Gain controls. Input level controls allow the user to select which input is being used. With Crossover controls, cutoff frequency of the low-pass filter are easily changed. The amplifier also allows connections such as, Power/Ground, Remote Turn-on, Speaker Outputs, Speaker-Level Input and Line-Level inputs. In addition, Bass Boost, Subsonic Filter and Phase Switch are also conveniently adjusted. Bass boost adjustment allow the user to achieve the perfect bass. Super-low frequencies are eliminated with the Subsonic filter which tend to lead amplifier damage if not monitored closely. Invert the speaker output by 180 with the Phase switch.